This movie is set during World War II, it investigates racism, humanity, and anti-war mainly through two 8-year old boys' senses. 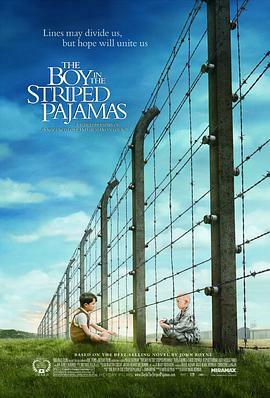 Bruno(Asa Butterfield), son of a Nazi German comandante, and Shmuel(Jack Scanlon), a Jewish boy sent to a concentration camp along with his parent(not showen in the movie), and the Brunos, only few leads, yet it interprets the hardship of war in depth, I enjoyed watching this movie as it makes me think deeply about human nature. The story is based on a true historical fact. During the World War II period, Nazi German occupied half of Europe and sent most of the Jewish descendants living under occupation to concentration camps set all over the continent, the most notorious one, was in Auschwitz, Poland, was called Auschwitz Concentration Camp. Some reviewers accuse of the writer delivering false images, they harshly criticize the fabricated plot as kids were the first victims got killed as soon as they arrived the camp, some even mention the name to the camp not respect history: Auschwitz, not Out-With as in the movie. Well, they are right, but for me, feature movie is basically made-up patterns out of reality, it is not necessary to 100% stick to the fact like documentary. A movie has a form of creative or freedom, it could decide about narration itself, the important part is what messages it delivers, not some certain facts in reality. Let's say, we just pull these arguments about historical accuracy off the wall and focus on the ideas the director(Mark Herman) would like to pass to the audiences. In the movie, Bruno is shaped as an overcurious kid, he likes asking questions. the movie starts with his question: mom, what's going on?, whereas his sister, Gretel(Amber Beattie) tends to pretend a grow-up, her first sentence in the movie is the definition of the word Promotion. Such comparison between this siblings could be seen as an investigation of humanity, as well as differences between Bruno's father, grandfather, the tutor, Lieutenant Karl and Bruno, his mother, grandmother, Karl's father. These people share different opinions on the war, the Jews, their country. Bruno's grandmother only appeared in the beginning, we can only guess her political view by Bruno's mother's interpetation and respond, we know that she is sick of what her son is doing, however, according to Bruno's grandfather, their son is in history making. Such Disputes breaking out in this family reflect the country, not all German agree with this war, too. We still see humanity in that crazy period, especially when the Nazi needs to shoot a propaganda clip to mislead the public. Bruno: Why? What have you done? Shmuel: I am a Jew. This movie did not show me any body or any fierce battle scene, unlike the beginning of movie Saving Private Ryan(1998), I had a strong impression of the cruelty of war about that movie, however, the bloodiness and brutality of war were revealed fully. The smell, comes out from chimneys, is described and talked in different ways by different noses, it has been mentioned 3 times. One time it's discussed between Bruno and Shmuel, one is with Karl and Bruno's mother, the 3rd time is when Bruno is with his family. It's not hard to understand that the Smell takes an essential part in the movie as the director uses three patterns to describe it. From Bruno's part, we know that it smells bad; from Karl's tongue, we know the smell does not come from some old clothes or hay, but the victims, they were being burned down, and from Bruno's father, he answers his son's question of what it(the smell) is: I think they just burn rubbish there sometimes. We could see that Bruno's father knows this is not right as he has to tell a white lie to his son. I am sure there's no better way than to illustrate the opposition to war and violence through the initiator himself. For me, I would love to say it is a great smash, definitely worth watching, particularly the unexpected ending, but still, it has some defects, for example, the absence of reason from the part when the Brunos were having dinner, Pavel, the Jewish slave acted in a nervous manner, he then knocked over Karl's wine glass, resulted in his implied death, well, some reviewers joke about probably, Pavel was Karl's father who left the Third Reich because of his humanity faith. Indeed, it would be dramatic if Pavel was Karl's father.